I also found my first Studland Grey Phalarope at South Haven and a refind of a Black Guillemot off Old Harry (over a week after it was seen at the harbour mouth): but the photos of both species were too crap to keep. At this point, I should probably display a map of the area & draw a border on it. The easy option would have been to copy a map & draw a border on it. But that would have broken somebodies copyright (I strongly disapprove of those bloggers who put anybody else's material on their dreary Blogs to make them look better, especially when they don't even acknowledge the owner). So I've had to hand draw a map & add a few labels myself. This is best compared with an OS map to see the missing detail. The patch is about 3 miles from top to bottom and about 3 miles from East to West at the bottom, but it tapers to a narrow point at the Northern end at South Haven, which is the Southern side of the Poole Harbour mouth. The Eastern side is Studland Bay which is the sea side of the patch. 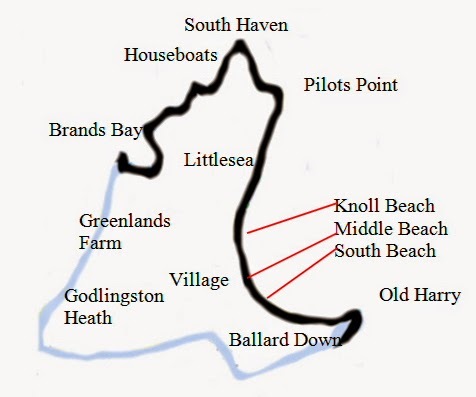 The North Western side from South Haven to Brands Bay is a tidal area with varying amounts of mud depending on the tidal strength. There is a freshwater lake known as Littlesea surrounded by heathland, dunes, woodland & wet marshy areas. Greenlands Farm is mainly grassy fields which through grazing has been changed to grassland from the surrounding Godlingston Heath (heathland). Ballard Down is a mixture of chalk grassland & farmland. An overall view of the patch from Ballard Down forms the banner photo for the Blog. Crucially, I count species seen within the boundaries, but also seen from inside these boundaries. Thus, Birds seen in Poole Harbour or Studland Bay are acceptable. Here are a few more photos of the patch. My Studland/Ballard patch list is 215 species, plus Nightingale heard. I've seen, but do not, count Crap (Feral) Pigeon. The varied habitats all help to ensure there is a wide range of species on the list. A full copy of my Studland/Ballard list can be found on Bubo. There are plenty more great views of the patch, but I will have to photograph them & add them to the Blog over the next year. Anyway, in the next Post, I will provide a summary of my first month of the Patch Year List. It has been a great start to the patch Year List. Having had a relatively quiet day on the Studland/Ballard Patch, I was ready to head for home mid afternoon, when I had a call from one of the locals, Steve Morrison. He had just seen the breaking news of a Great Grey Shrike on Godlingston Heath. This is the South West corner of the patch, but is the most underwatched part of my patch, after the nudist beach area. The details were vague, just a text from a friend of a friend saying there was a Great Grey Shrike seen whilst walking somewhere on Godlingston Heath. There was no opportunity to check where it was, so Steve and I met up & started scanning from the high hide part of Studland. It is easily 1/2 mile to the nearest part of the heath & well over a mile to the Southern end. Looking into the light didn't help. After 20 minutes, I suggested Plan B, to look from the top of the heath. There is a good, but more restricted view. No joy in the first 15 minutes of scanning & I was about to suggest moving to a different viewpoint, to check the rest of the heath, when Steve said he had found it. It was about 200 metres away from us, sitting on the heath. Not great shots, but better than nothing. We were lucky it was so close, given how large Godlingston Heath is. There are only 14 records involving 11 individuals between 1952 and 1989 on the Studland patch. Since that date, there has only been one more record: an individual seen on 24 & 28 Mar 11 on Godlingston Heath. So despite being more or less annual within Poole Harbour, it has become a very rare Bird on the Studland patch. Most Poole Harbour records have been around the Hartland Moor/Arne part of the harbour. 16 Jan 15 - Is It Spring Yet? Today, the forecast was for light, but steady, rain for most of the morning with it clearing up for the afternoon. About 09:00 it was overcast, but that cleared later into the morning to leave a great mild, sunny day & crucially little wind. So a lot better than forecast. It felt very Spring like from late morning onwards in the sun. Early afternoon saw me heading out to Greenlands Farm area of Studland in the hope of adding Fieldfare to the Studland/Ballard Down patch year list (which I did with a flock of 12). But as I walked along the track leading to Greenlands Farm, I bumped into my first Butterfly of the year, flying around & sitting in the sun. This was my second earliest UK Butterfly. My earliest is a Red Admiral in the nearby Rempstone Forest on 11 Jan 13 which is another regular over-wintering species. Unfortunately, about 2 hours later from seeing the Peacock, the weather started to change to overcast conditions with a cold wind getting up. Hopefully, the Peacock was back in a warm roost spot by that time. This year has also seen my earliest Bumblebee, when I had a Bumblebee fly through the garden on the 6 Jan without stopping. This beat my earliest previous record of a Bumblebee sp at Swineham on 26 Jan 13 by nearly three weeks. Is it Spring yet? This year I have decided I will go for a Studland/Ballard Down patch year list. My best Studland/Ballard Down patch year list is 176 in 2009 (following BOU taxonomy). This excludes Crap or Feral Pigeon which I saw, but I ignore all of the feral crap/racing pigeon individuals I see in the UK. This shows how good the area can be given its only about 3 miles long at the Southerly base & 3 miles from the base to the Northern boundary at the Poole Harbour mouth. It has been a few years since I have tried for a patch year list & as a result I have found I haven't been as motivated to get out onto the Studland/Ballard Down patch as often as I could have in recent years. So to incentivise myself, I've decided on another patch year list. I won't be registering for the Patchwork Challenge as it is too large a patch & I don't want to narrow my attention down even further. I won't be competing against anybody other than my younger self (from previous years). I will aim for monthly patch updates on the Blog as to how the year list is going, but will put occasional extra Posts in when good birds warrant them. But the year started well with catching up on the first of the month with the wintering Great White Egret on Littlesea. More recently, I've seen it well on a couple of occasions, whilst out looking for Coot on the patch. It is perhaps ironic, as well as sad, that I'm now regularly seeing Great White Egrets on the patch since 2 individuals turned up in Autumn 14 (now down to 1 individual), whereas Coot has more or less died out. Coot had a small resident population on Littlesea lake up to 2011, which swelled every Winter to about 120 individuals. Since that date this population has disappeared & I've only seen a couple of sightings on the small South Haven pool. Unfortunately, Carp has somehow become established in Littlesea in recent years & I suspect the disappearance of the Coot, is largely a result of the impacts of the many large Carp on the freshwater weed that the Coot used to feeding on. This is the same First Winter individual with the buff edges to the median & greater secondary coverts that was photographed back in Sep 14 around Littlesea, Studland & Brands Bay which is part of the Studland patch. I've not seen the second pure First Winter white individual since mid Oct 14. Today was the traditional Poole Harbour Pelagic which has been running on the 1st Jan every year for about 12 years now. The boat left from Poole Quay at 11:00 allowing a full three hour pelagic before returning. Occasionally in previous years we have almost left the confines of Poole Harbour to allow for a look for Purple Sandpipers on the groynes at the Poole Harbour mouth, but this year, we didn't get that far. Therefore, there is generally little chance of seeing more than a selection of Divers, Grebes, Duck as well as a look over the seawall at the Brownsea lagoon and any other Waders we bump into along the edges of the harbour. But it is a great sociable day out with many of the local Birders as well as a good selection of Birds. The trip started off pretty normally with a few Great Crested Grebes, Red-breasted Mergansers & a Great Northern Diver as we headed for the Harbour mouth. No sign of the Purple Sandpipers on the groynes (they had been seen earlier, but there were so many grockles out for a walk, I wondered if some new shops had opened on the beach). Onto Brownsea, where a good selection of typical Waders were on view by looking over the sea wall, including Greenshank, Redshank, Grey Plover, good numbers of Avocets, as well as various commoner Ducks & a single Spoonbill. Carrying on, the two Sandwich Terns that had been around the Harbour mouth at first light put in an appearance for everybody. It is an unusual year when we miss Sandwich Tern on the first of Jan pelagic. This was followed by the appearance of the 1st Winter Little Gull that had been hanging around off Furzey Island for the last couple of days (that is a more unusual species given the lack of recent Winter storms). The obligatory look for the Furzey Island Golden Pheasants on the slipway was tried, but none seen today. You really need a couple of hours more than than two minutes we gave it as we cruised by. Then it was onto Newton Bay on the West side of the Goathorn Peninsula from Studland. I always enjoy a look along this part of the coastline as it is an area that is difficult to view from the land as most of it is private & the views from public access paths are distant. This produced a selection of typical Waders & this Spoonbill. Normally, we would continue onto the Ower/Fitzworth Bays before reaching Arne. But today the tide was too low & we had to return towards Brownsea. A good thing, as on the return somebody at the back of the boat picked up a Black Guillemot. This has probably been around the Poole Harbour area now for about three weeks. In that time, it has been seen for about 15 minutes off the Harbour Mouth, then a week later I refound it off Old Harry (where it was on view intermittently for an hour) & then seen for a minute yesterday at the Harbour Mouth. After the shout went up, the boat was turned around & the twitch was on. A few minutes later, this Poole Harbour rarity finally gave itself up to the boat. Finally, a big thank you to Mark & Mo for inviting us all onto the boat. Also a big thank you to Justin for bringing along some stunning local cheeses (I can recommend you pop into the the Town Mill cheese shop if you are in Lyme Regis). A great day out. Finally, if you are thinking it's not really a pelagic, then we were in the second largest natural harbour in the world & Black Guillemots are a pelagic species.